Last week William O'Keefe, a CRS vice president, asked Congress to fund USAID to the tune of nearly $9 billion. They intend that it goes to PEPFAR and other agencies that distribute contraceptives. Lepanto Institute discovered this and did much research. There is no need to rehash the report here for I won't do it justice. I urge you to read it on the Lepanto page. Do note, though, that O'Keefe was a Clinton supporter. During Lent, we have probably seen the ubiquitous CRS "rice bowls". Michael Hichborn, president of Lepanto, noted that 2/3 of CRS's budget comes from federal grants. Well, golly gee! Why aren't People for the American Way and the Freedom from Religion Foundation all up in arms about federal funding of the CRS? Could it be because they know that CRS has been run by progressives now for many years? He suggested that in lieu of money, to write a note that says we already contributed via our tax dollars. 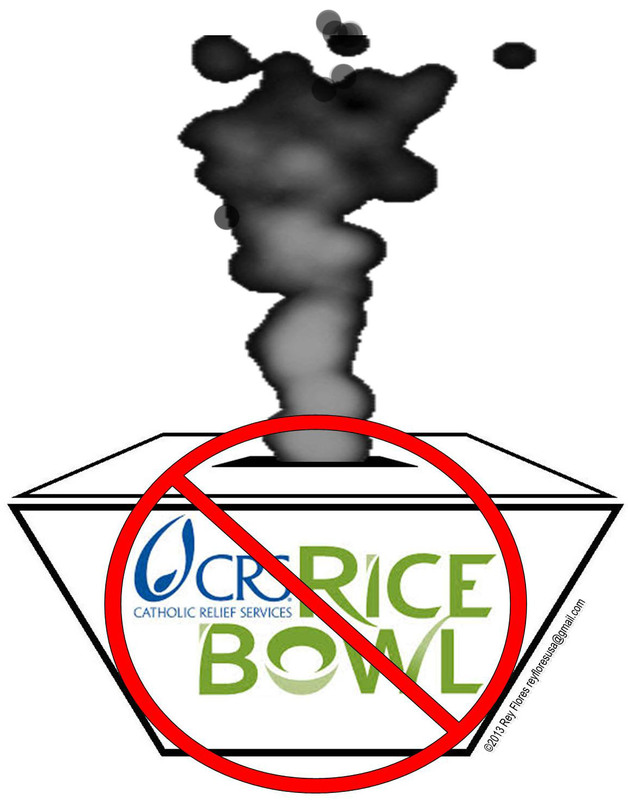 Drop that in your "rice bowl" and take it to church when they collect these things. Here's more info on CRS. Just #sayno2crs. By the way, in my title I used the words "to date" for I wouldn't be surprised if another CRS scandal comes to light in the future that will eclipse the depravity of this one. You did an Excellent job, as usual, Janet! Thanks, again. I will be posting this online & passing the word.